The STEM Leadership Experience is an immersive, hands-on workshop for high school girls, designed to teach STEM content while building relationships between students and STEM professionals. 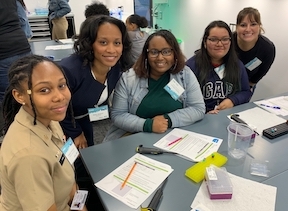 This afterschool experience breaks down barriers that keeps female students from choosing STEM majors and careers by introducing students to female role models in an open and non-threatening environment. The experience builds relationships between students and mentors, and facilitates honest conversations about gender, family, careers, and the role these factors play in career success. For more information on hosting a STEM Leadership Experience, contact Alejandro Cardemil at 240.552.9313. During this workshop, students are paired 1:1 with mentors from local STEM organizations for a hands-on lab activity. Mentors also answer student questions and share their personal stories about their career path, what their job is like, and how they came to work in STEM. Below is the schedule of events from our most recent STEM Leadership Experience. Learning Undefeated’s team will customize the experience to suit the needs of our corporate partner. 3:30 PM “What’s your –ology” Panel Discussion | Panel will feature 3 – 4 STEM professionals at different stages of their career path, who will talk with students about their jobs and the rewards of working in STEM. Students will have an opportunity to ask questions in person and we can also seed the discussion with questions collected during the registration process. 4:00 PM Hands-on Lab Activity | Students transition into working in small groups; 5 small groups of 4 girls each + 1 mentor at each lab table. During the session, mentors assist students as they work through a laboratory activity, which will be led by one of Learning Undefeated’s science educators. Volunteers will engage with small group of students to help with the steps and share their passion for STEM throughout the session.